Pain is something we all want to avoid in our lives, and with the exception of a very few special people, humans have been vigilant to find ways to eliminate, escape and get over this pain throughout our history. The use of opium poppy, one of the first analgesics, dates back to 3400 B.C. in lower Mesopotamia. Since then there has been many different kinds of psychotropic drugs to cure emotional pain. While effects of those drugs are somewhat general and less safe so far, thanks to the recent breakthroughs in neuroscience, the types of medications are becoming more specific and getting safer. For example, beta blocker is one of those drugs that affect our emotional condition by altering our emotional response to our memory. Can't you minister to a diseased mind? Pluck a rooted sorrow from the memory? Which will make her oblivious to all those things? If Macbeth was born in these days, and asked the same question, the answer of the doctor may be "take Beta blockers" instead of "minister yourself." Beta blockers are a class of drugs that block the action of endogenous catecholamines. As a result, this helps people alleviate symptoms like hypertension, rapid heart rate, and tremors. Besides reducing existing anxiety in people, beta blockers are also used to dull emotional pain attached to bad memories. 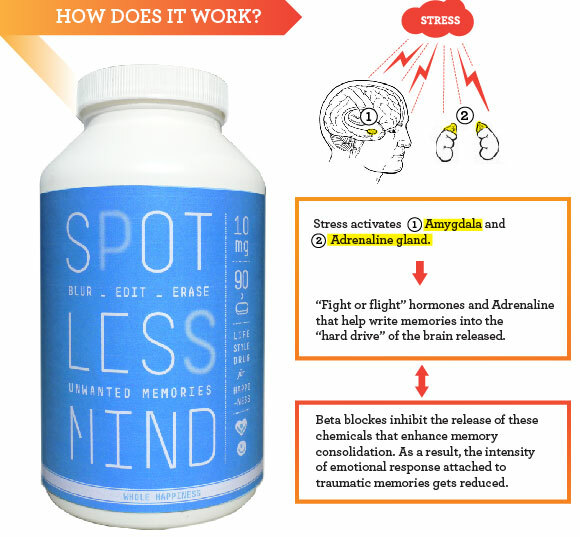 So this is not a memory eraser similar to the device appeared in the movie, "The Eternal Sunshine Spotless Mind". This medicine is mostly used to cure patients suffering from PTSD(Post Traumatic Stress Disorder). They usually re-experience the traumatic events persistently and avoid space, people, or objects that tend to recall the memory. Often, it becomes extremely difficult for them to continue a normal life, if not impossible. Using beta-blockers for this case seems understandable, but what if the use of this medicine becomes as common as antidepressants? What will be the criteria of determining people who merit this treatment? Is feeling happy and comfortable a better choice than remembering things truly and maintaining our true identity?